This paper studies answer set programming (ASP) in the generalized context of soft constraints and optimization criteria. In analogy to the well-known Max-SAT problem of maximum satisfiability of propositional formulas, we introduce the problems of unweighted and weighted Max-ASP. 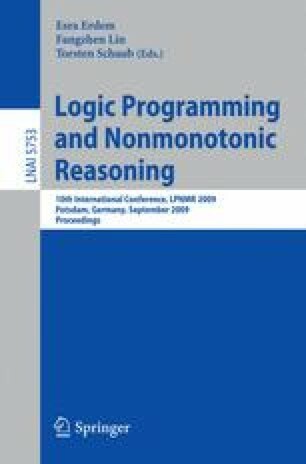 Given a normal logic program P, in Max-ASP the goal is to find so called optimal Max-ASP models, which minimize the total cost of unsatisfied rules in P and are at the same time answer sets for the set of satisfied rules in P. Inference rules for Max-ASP are developed, resulting in a complete branch-and-bound algorithm for finding optimal models for weighted Max-ASP instances. Differences between the Max-ASP problem and earlier proposed related concepts in the context of ASP are also discussed. Furthermore, translations between Max-ASP and Max-SAT are studied.